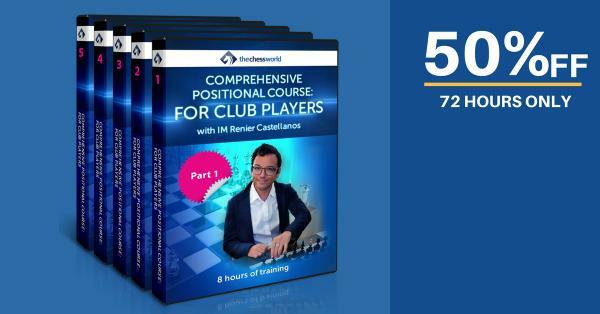 COMPREHENSIVE POSITIONAL COURSE with IM Renier Castellanos | Free chess downloads and training sites. Study material and suggestions. Online shopping. ← [Free Course] Master Calculation with IM Lilov! Most club players find it very difficult to improve the positional understanding. There are many reasons for it: there isn’t much materials available on this topic for club players, they don’t know what and how to study, what’s important and what’s not. Not learning positional fundamentals stagnates your progress and disabled you from performing at your best. And we believe it’s unacceptable. That’s why we’re are rolling out this new course to help you out quickly mastering positional chess. This course is not magic; it is a highly structured training covering 15 most important positional elements that every chess player must know. You won’t wake up a positional expert overnight, but thanks to IM Castellanos’ decade of experience, you will get an unparalleled edge against your competition! How to decide what pieces to trade and what pieces to save [a master’s method]? If you are a beginner or a club player, that values his time and wants to see RESULTS, this is a must-have chess course!